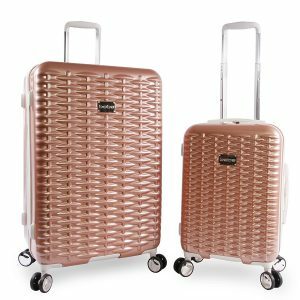 Rose gold BEBE Women’s Lydia (BE-PC-8400-2-RSGD) is a set of two pieces of stylish and functional 29 and 21-inch suitcases with spinner wheels and a uniquely beautiful design. It is made of sturdy yet lightweight PC- polycarbonate material, so the bags are lighter than normal and this will let you pack more of your stuff. The 21-inch bag weighs 6.4 pounds and measures 21.5 x 9 x 14 inches including the wheels. And it qualifies as a cabin luggage for most global and domestic airlines and is good for short trips away. The 29-inch luggage weighs only 8.9 pounds and measures 29.5 x 11.5 x 18.5 inches and can fit in a lot of your stuff for longer trips. Each bag has a total of eight 360-degree rotating sturdy spinner wheels and with the help of the push button lock aluminium trolley handle, it can be moved through the airport terminals and parking grounds smoothly. They are very easy to roll and will not put any strain on your shoulders or your body. The main thing that stands out about this luggage set is its unique elegant design. The black “Bebe” floral print looks great on the rose gold colour textures surface. And the bag is guaranteed to get looks in the crowds and you’ll be able to pick it very quickly on the airport carousel with its distinct colour and design. Inside you have the beautiful white on black “Bebe” printed lining, cross straps on one side and half size zipped mesh pocket and another full size zipped pocket on the other side. Please note that these hardshell bags are not expandable but are quite spacious inside giving you a fair bit of packing space. They are durable, reliable, functional, and flexible and will let you travel easily and in style. Bebe Women’s Lydia is one of the better selling fairly new release suitcase sets on Amazon.com and there aren’t any customer reviews submitted yet. But the ones we’ve viewed on other sites are mostly positive four to five-star ratings and reviews. They qualify for quick shipping via Amazon.com these days and are usually sent out within a couple of days. You will get two years of warranty on this luggage set and you can email or call the Bebe customer support and they’ll be more than happy to assist you.